The baseball season is off to a fast-paced start, as our fearless Cardinals have already played 20 games. The first part of the season took place during spring training in Tucson, Ariz. Playing a packed schedule against schools from around the country, Wesleyan emerged with a 5-7 record after the preseason circuit. Notable wins included the demolition of Dubuque 18-4 on March 14, which saw Danny Rose ’19 going 4-4 with a pair of RBI and Ryan Earle ’19 and Andrew Kauf ’20 pouring on three hits of their own. The Cardinals’ victories only continued as they trounced Grinnell College, Macalester College, and Hamline University all in the span of a week. Against Macalester, the Cardinals won 16-9, with four RBI from Kauf and David Redfield ’21 picking up the win on the mound. The in-conference games began on March 29, with a three-game series against Amherst. The Cardinals went 2-1 over those games, a great start to the regular season. 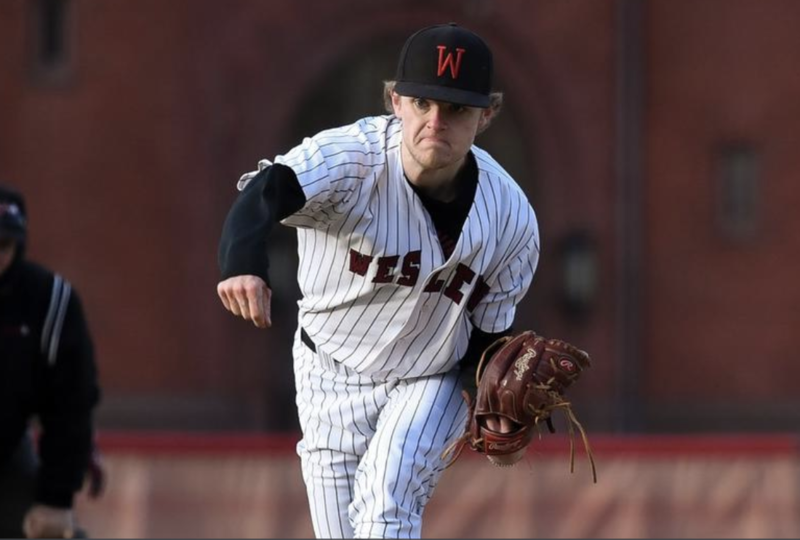 On the 29th, Wesleyan won 4-2, behind a solid pitching performance from Kelvin Sosa ’21, who threw five strong innings along with five strikeouts and a win. Pat Clare ’21 then tossed the final four, conceding only two hits and zero runs. Leadoff hitter Alex Cappitelli ’20 went 2 for 2, scoring twice and adding an RBI. Rose and Adam Geibel ’22 each added two hits of their own. Overall, it was a masterful start of the season. The second game of the three games had the Cardinals winning 4-2 over conference rival Amherst. Once again, it was the dominant performance from the pitching staff that carried the Red and Black to victory. Dan Lombardo ’19 went four-and-1/3rd innings, surrendering two runs and striking out three. Alonzo finished the job with a scoreless two-and-2/3rd innings to seal victory for the Cardinals. Andrew Keith ’19 plated two runners, helping to provide the offense needed to bring the Red and Black to victory. The final game of the three games featured another stellar pitching matchup, this time with Amherst coming out on top despite the best efforts of Earle who tossed four strong innings. Overall, winning two of three to begin the season was a fantastic opener for the Cardinals, who left the first weekend confident in their pitching and ready for the bats to awaken. And awaken they did. During a midweek contest against out-of-conference Johnson and Wales University, the Cardinals domesticated the Wildcats. In an 18-5 pummeling of J&W, the Dirty Birds showed us what they were capable of. The highlights included a three-for-five showing and four RBI from Chase Pratt ’20. Wesleyan also jumped out to a 14-0 lead by halfway through the third. This hitting explosion was paired with a flawless, errorless game in the field. This past weekend, the Red and Black faced a grueling three games in two days. It started on Saturday, with another pitching duel against Hamilton. Our Cardinals came out victorious against Hamilton, winning 3-1. Once again, Sosa and Clare carried the day, fanning seven-in-seven strong innings of work. With the score tied 1-1 going into the bottom of the third, Wesleyan provided all the offense they would need on the day, with a Rose single and a triple from Pratt. The second game of the day was not as successful for the Red and Black. Hamilton scored six before the Cardinals had touched the scoreboard. However, the Cards also showed their resilience and did not let the game get out of hand. A big takeaway was Nolan Webb ’20’s dominant five-inning relief performance, where he held Hamilton scoreless and saved the bullpen for future games. Additionally, the Red Birds hung two runs on Hamilton in the sixth, keeping the game close, showing they were ready to fight until the final out. In the final game of the series, the Cardinals again fell to Hamilton. Playing on a beautiful Sunday afternoon in front of a large crowd on Foss Hill, the Cardinals again fought valiantly in a slugfest against Hamilton. With Hamilton socking 16 hits and 11 runs, the high-powered Cardinals could not keep up, getting ten hits but only scoring five. Playing to their final out, the Cardinals left the weekend with a 3-3 conference schedule. Although they may have wished for a better record, the Cards have shown us their pitching can be electric. With a couple of mid-week games and an offense just beginning to realize its full potential, the Dirty Birds will be looking to get back in the win column.